Victoria, Mahe (Seychelles) – September 5, 2018 (travelindex.com) – Discussing the challenges and successes of the Indian Ocean Vanilla Islands was reason enough for two meetings between two founding Presidents of the Vanilla Islands. President Didier Robert, the President of the Regional Council of Reunion met with as I was in Reunion on private business. We had worked together closely when I was the Seychelles Minister for Tourism, Civil Aviation, Ports & Marine. Our meetings took place in Boucan Canot on Friday the 31st August, and again in St. Denis on Saturday the 1st September and together we discussed the Vanilla Islands. 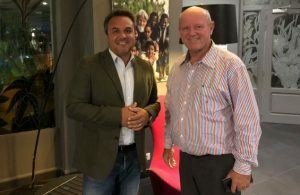 We both agreed that the drive behind Cruise Tourism for the Indian Ocean had been largely successful because of the hard work and dedication of Pascal Viroleau, the CEO of the Vanilla Islands and now more new Cruise Ship Companies are looking at the region. It was the opportunity to also alert President Didier Robert that air access and the needed connectivity between the islands was still a challenge that would continue to hamper the twin and three islands holiday option for the region. Even though Air Austral had achieved excellent developments in Madagascar, Mayotte and La Reunion by standing behind the Air Madagascar and Ewa Airline, to open up the triangular approach with La Reunion, Madagascar and Mayotte, the political will needed to drive an adequate air connectivity strategy was still lacking for other areas. To access La Reunion through Mauritius from the Seychelles, it was still obligatory to check in luggage to Mauritius, then having to clear Immigration and Customs before going through the formalities of re-checking in for the onward flight. I was able to speak by experience having just done that last Thursday. Regional visibility among other matters was also discussed because it was so needed to keep the Vanilla Islands name relevant as a tourism region. Maritime tragedies have hit Seychelles. In August, two young children drowned as their boat capsized on their way back to Praslin from La Digue, after the 15th August Celebrations. This incident was followed by “Sea Horse”, an Island Development Company (IDC) chartered landing craft, acting as the supply ship to Coetivy Island, catching fire and later sinking and leaving four crew members unaccounted for and one crew making it safely ashore after receiving help from the island. The maritime challenges of the month continued, with Kenyan-flagged vessel Diamond Ace 1 running aground between islands in the Sainte Anne Marine National Park. What that foreign flagged ship was doing is this marine park area is still unclear. The Director General of Seychelles Maritime Administration, Captain Joachim Valmont confirmed that Captain Pierre Grandcourt, along with Port Authority personnel boarded the boat Mearl, to go out to the reef between Cerf and Long islands to assess the situation where the Kenyan-flagged vessel Diamond Ace 1 had run aground. The team travelled out in the hope of pulling Diamond Ace 1 off the reef. Maritime Safety reported that the boat that Capt. Grandcourt was travelling on was trying to get as close to the scene as possible, when the boat was hit by a large wave and Captain Grandcourt was thrown overboard. It was reported that the crew members of Merle tried to pull him in, but unfortunately by the time they managed to pull him out of the water, he was unconscious and was taken to the port where an ambulance came to assist, but he passed away and compounding the maritime tragedy spell hitting Seychelles. This was followed by a cargo schooner ‘La Providence’ as it was heading for La Digue from Mahe last week encountering difficulties ‘en-route’. Jeffrey Durup is a known seaman of the Seychelles and has been on the sea for most of his working life with his schooners serving La Digue and also the other private islands as supply ships. A couple of years ago he was joined by his son Lenny who qualified as a sea Captain and who had become the first Seychellois to take command of a Seychelles tanker- ‘A challenging career but there’s no going back’ were words written by Seychelles Nation newspaper of Lenny Durup. Lenny grew up on La Digue working with his father in the family’s two cargo vessels – “Kapris Letan” and “La Providence” and has now acquired “Glory” the Durup Family’s new landing craft that is set to offer to Diguois and the island a more complete service. Seychelles has over the years developed an expertise which is today accepted as a revolutionary coral reef restoration success. Seychelles reef restoration project has achieved the extraordinary by raising over 40,000 corals fragments in underwater nurseries and transplanting a 5,500 square metre of degraded reef – the size of a football pitch – with these corals. The project is carried out by local NGO Nature Seychelles and is the creation of Seychellois environmentalist and the NGO’s Chief Executive, Dr Nirmal Shah. Seychelles is today able to offer this expertise to other countries in their own work and efforts to save their reefs. The recent protests by Taxi Operators outside the gates of the Kempinski Resort in Seychelles demonstrated the need for the tourism industry to work together with everyone respecting the responsibility of the other. The Kempinski Resort and the Seychelles Taxis Association need to meet to ensure such incidents are not repeated. We received many messages from Tour Operators and past guests of Kempinski Resort seeking more clarification of the event that saw the hotel guests blocked inside the property. Each country has rules and regulations that need to be complied with for the smooth running of its major industry.